Japanese Pop-Up Store to Create Miniatures of Visitors #3dthursday « Adafruit Industries – Makers, hackers, artists, designers and engineers! it is the world’s first attempt to leave the family portrait in the form of a figure of 10’s. By 10’s, they are referring to 10cm high figures — one of the standard art toy/miniature sizes popular in Japan. 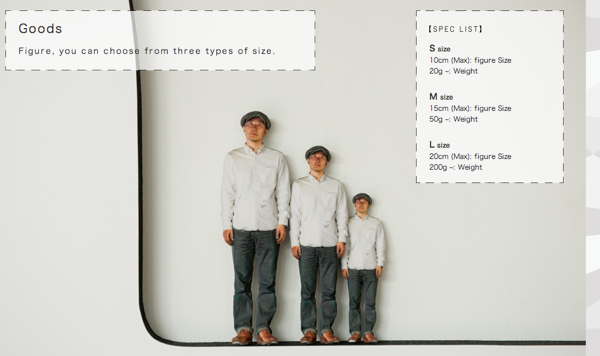 It looks like they offer 15cm and 20cm sized figures as well — pretty large printed portraits! Children under 6 years old, pet photography is not recommended. We recommend that you take pictures in the pose without unreasonable. Fine patterns and complex patterns can not be taken. You can not take a picture of the material is shiny costume accessory. I can not shoot with a mesh material materials and fluffy. You can not take a picture material is thin and fine material. Irregularities can not shoot heavy material. Customers are wearing glasses, you will be disconnected shooting glasses. Accessories such as bag, the picture can not be taken. This is solid advice, typical for 3D scanning — but rendered into poetry via the dubious translation.